It is that time again! EASTER!! Few days ago, the Royal Easter show opened its doors to a new generation, to experience the wonder and delight of visiting the show. I remember the times when I went to the Easter show, only during my childhood though. The wonder of the food (often sugar coated and deep fried), the fun rides and games which we know now are over priced and the best thing of all the show bags. The show bags are my favorite part of the show even to this day: I don’t know, there is something about cheap china made gifts and hundreds of candy and sample products that gets me excited. Even though I love this part there is one thing about this experience I can not shake. I hate to say this but nothing will ever beat the experience of going to the Easter show for the first time after that. It just gets more disappointing. Every year I would either find something more disappointing or something I used to love would not live up the expectation. Could it be the progression into tweeny years leaves you bored at the spectacle of farm animals? The heighten sensitivity to smells, taste and noise? If you have ever been to the cow or horse stable at the Royal show, you will understand the case about the smell. The realizations that the gifts and novelties are overpriced bits of junk? Alternatively, heaven forbid your taste change and you realize you actually do not like candy or chocolate anymore. Thankfully the last one did not happen to me. I broke my love affair with the Easter show once I learnt the value of money (I know, it is so frugal to think of that first). Learning that money does not grow on trees popped my experiences from then on. While I do not blame the teachers at school tell me the honest truth of business, they could of waited a bit longer before they told me at age 8! Oh childhood ending right there. I often speak of my child hood experience with food here. Something I Absolutely HATED when I was a child was hot cross buns. The combination of spices, fruit and that stick glaze which often made me frustrated (I was messy eater as a child). Of course we grow up and now the spices and fruit which I loathed I absolutely love now. My love for dried fruit sees me going through a 1kg bag of sultanas in a month by myself, cinnamon and mixed spice is on everything sweet and glaze; I think that speaks for its self. The funny thing is I still can not stand the store brought hot cross buns, even though I love the ingredients now. This is serious dislike considering how much I love anything with yeast in it. This is the first time I have tried to make hot cross buns, but considering I still dislike the traditional forms; I decide to try the more mainstream version. Chocolate is good; it makes anything better, mops up tears and spark world peace. Fluffy cocoa base bread with the intense backdrop of spices and double chocolate chunks, heaven in a nut shell for me anyway. I used a basic milk brioche dough to form the basis of these buns, mixed in some bitter sweet chocolate and topped it off with a cross made from milk chocolate. 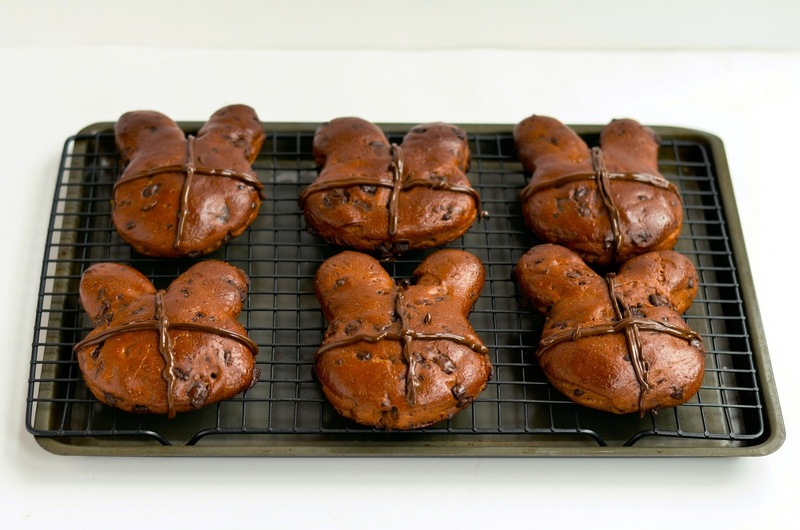 The shape is just for a bit of fun and personality, besides this is the only time were the rabbit cutter is used more than another other time of year. Brioche is fantastic rich bread which is base note of some of my favorite British puddings. So if you have The chance sneak a few away and leave them to go stale. Trust me, bread and butter pudding with chocolate brioche is so worth the calories (I actually do not care, but it seems people are being more concerned about this). 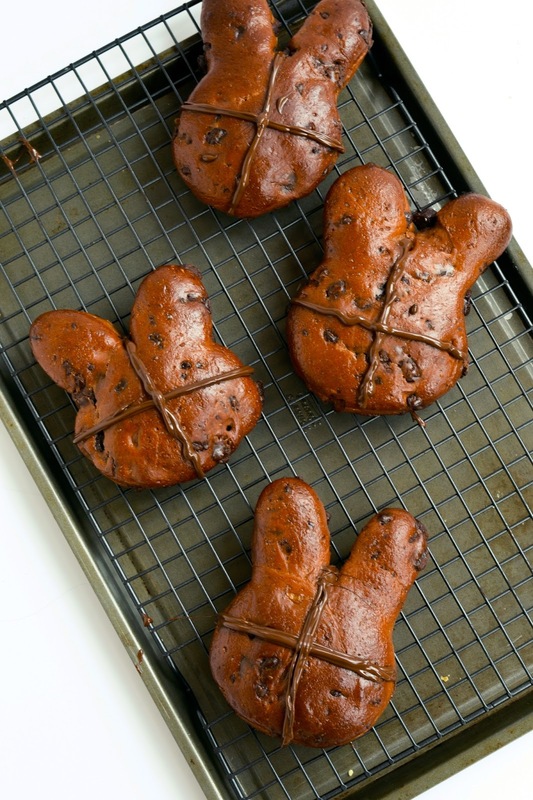 Triple chocolate hot cross bunnies. To knead by hand: mix all the ingredients in a large bowl, and bring it all together to form a dough. Knead for about 10 minutes, until smooth and shiny. Preheat the oven to 200°C. For the glaze, beat the egg and milk together. 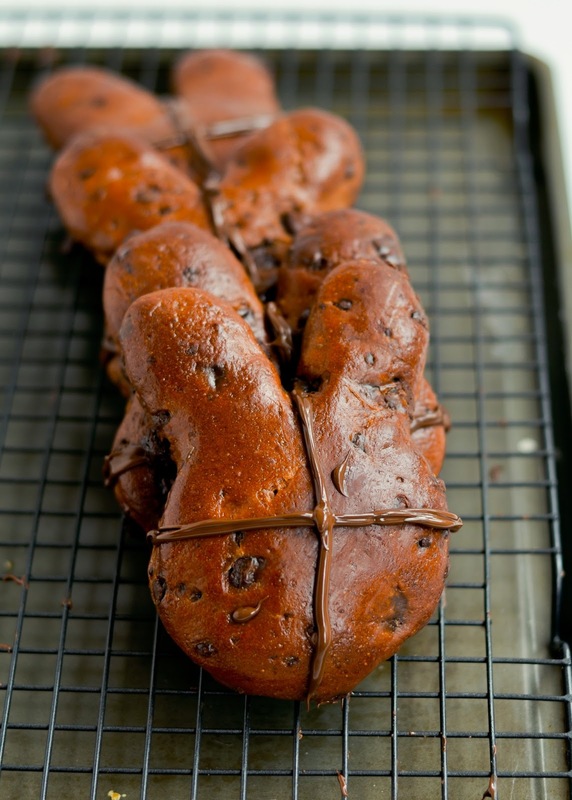 Transfer the risen loaves to a baking tray and brush all over with the glaze. further 30 minutes or until golden brown. Cool on a wire rack. Once melted leave to cool for 5 minutes. Place in pipping bag of choice and pipe a strip up and across each of the buns faces. Leave to set and then eat! Hi Belinda! I just wanted to say that I came across your blog after seeing this awesome pic. What a great idea! 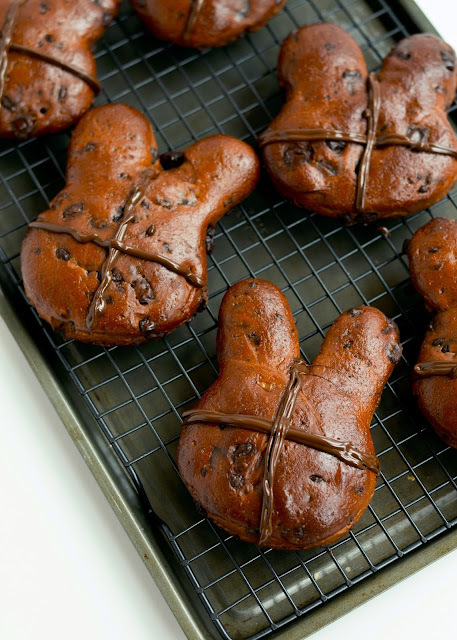 Your hot cross bunnies look so cute! I came across your blog via someone’s pin for your garlic scones – and thought I would stop by and say “Hi”. I was nodding my head with everything you were saying about the Royal Easter Show – but of course, because I am from Melbourne, we have the Royal Melbourne Show – but everything you were saying was exactly what I thought too. 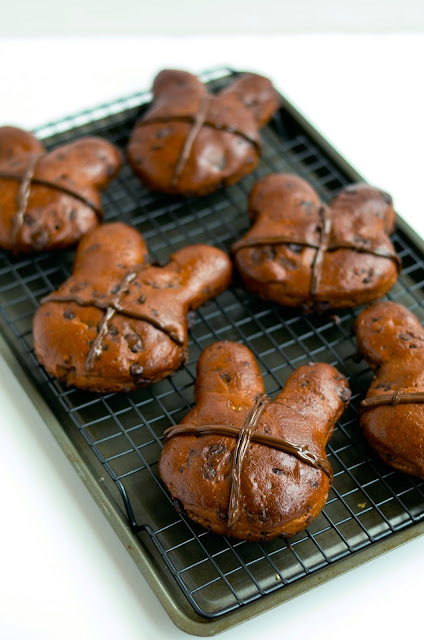 I absolutely LOVE your spin on the hot cross buns making them look like bunnies – such a cool idea. 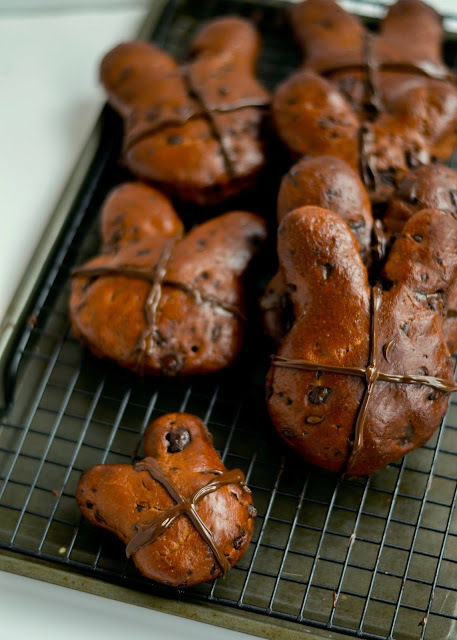 We are in the process of making hot cross buns as I write this and waiting for the mix to prove before we pop it in the oven – our first time baking them as a family (although I have baked them before in my ‘single’ days). Can’t wait for the cooking smell to fill our house – yum! Just joined up as a follower and look forward to your posts! Happy Easter! Hello Jocelyn. Thank for becoming a follower! It is nice to see a fellow Australian on the net. 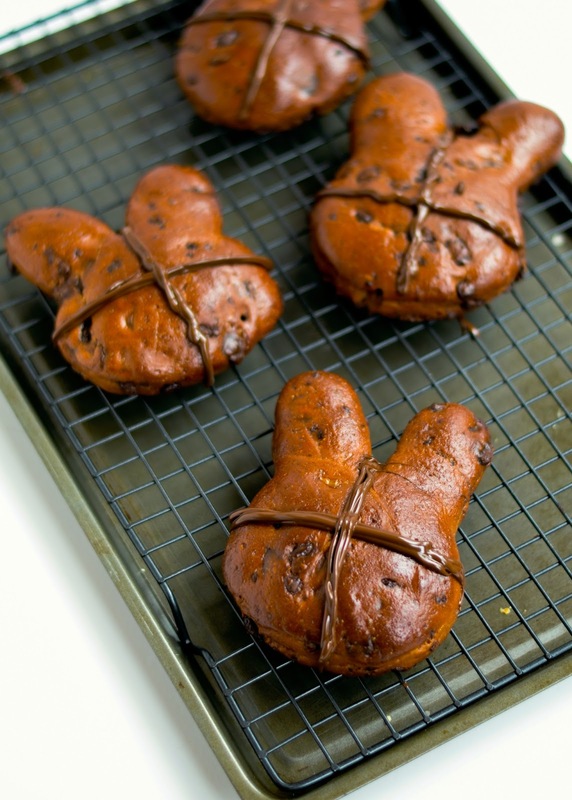 I hope your buns turn out fluffy and sweet to share with your family. Family baking is so much fun and I hope one day I will have someone to share my recipes with. Thank for joining and Have a happy easter!